178 pages | 4 B/W Illus. Critiquing the positioning of children from non-dominant groups as linguistically deficient, this book aims to bridge the gap between theorizing of language in critical sociolinguistics and approaches to language in education. 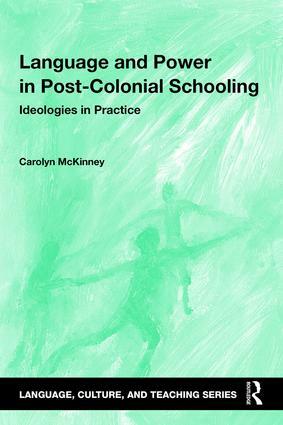 Carolyn McKinney uses the lens of linguistic ideologies—teachers’ and students’ beliefs about language—to shed light on the continuing problem of reproduction of linguistic inequality. Framed within global debates in sociolinguistics and applied linguistics, she examines the case of historically white schools in South Africa, a post-colonial context where political power has shifted but where the power of whiteness continues, to provide new insights into the complex relationships between language and power, and language and subjectivity. Implications for language curricula and policy in contexts of linguistic diversity are foregrounded. Providing an accessible overview of the scholarly literature on language ideologies and language as social practice and resource in multilingual contexts, Language and Power in Post-Colonial Schooling uses the conceptual tools it presents to analyze classroom interaction and ethnographic observations from the day-to-day life in case study schools and explores implications of both the research literature and the analyses of students’ and teachers’ discourses and practices for language in education policy and curriculum. What counts as [a] language? What counts as language in education policy and curricula? Whose language resources count in schooling? Positioning students in an Anglonormative English class: asymmetrical relations of knowing. Carolyn McKinney is Associate Professor, Language Education, School of Education, University of Cape Town, South Africa.